As I have mentioned in previous articles, there are probably as many different techniques in the use and operation of a neon plant as there are glassblowers, and the only thing that is important is what works best for you. The information that I give forth is from my experience and the experience of others and all the technical information at my disposal. 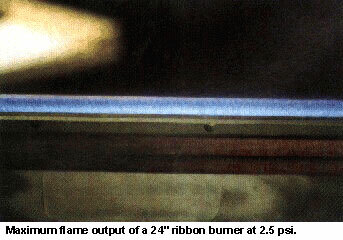 There are many different ways to supply the air that is to be mixed with either natural gas or propane to provide the proper flame for the neon glassblower. In my career, I have seen and heard of everything from compressed air to someone who actually used a vacuum cleaner! The two most popular types of air supplies are the lobe type blower and the ring compressor. I have used both types in different shops that I have set up and they both work extremely well and both have certain advantages over each other. When I first started blowing glass, the type of air blower that I first became familiar with was the lobe type, or sometimes called the "roots" blower because of the manufacturer's name. 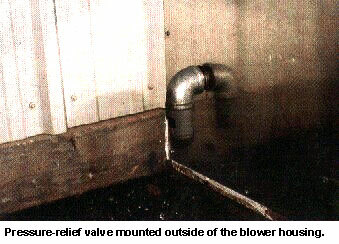 This lobe type blower used two mechanical lobes that were in the shape of a figure eight and rotated around each other at high speed to force the air in one direction or the other out of the housing in the direction desired, depending on the plumbing and the orientation of the blower. The blower was separate from the electrical motor and the air displacement was determined by the speed of the motor and the different sizes of pulleys on the motor and the blower. This is a distinct advantage of this type blower because once the actual air consumption requirement of the neon plant is determined, the speed of the blower can be set accordingly to provide optimum use and as little wear and tear on the blower as possible. Another advantage is that if in the beginning of the operation of the neon plant a large enough blower is purchased, it leaves an opportunity for future expansion by simply increasing the blower speed by changing the pulley sizes and providing the extra air volume to accommodate the additional fires. One drawback to the use of a lobe type blower is maintenance. The bearings in this type blower have to be greased periodically, and depending on the hours of operation, speed, and the operating temperature, this can be as frequent as on a weekly basis. This type blower also has an oil reservoir for the timing chain and the lobe gears and the level should be checked weekly and depending on how much use there is, it may need to be changed every two or three months. Because of the fact that the lobe type blower is separate from the motor and uses pulleys and a belt to transfer power from the motor to the blower, there is the distinct possibility of misalignment of the two shafts. It is very important that they be in proper alignment to prevent any strain on either piece of equipment which may cause premature wear of the bearings and much more serious damage to either one of the pieces of equipment. The belt must also periodically be checked for damage and proper tension and when the belt needs to be replaced, it is a very time consuming operation. Most neon plants that I have been to that use the lobe type blower have either the 24” or 36” size frame. These are more than ample for the neon industry, but whenever they run at higher rpm's they can be very noisy. In a two station plant that I helped set up, we used a 24” blower and to achieve the 55 cfm required to operate both sets of fires, we ran the blower at 2400 rpm. With the blower located outside of the shop in a shed, it was still fairly loud inside because of the sound coming through the plumbing. We were able to put an exhaust silencer and cut down substantially on the interior noise level, but this did nothing to help the neighbors on the outside. 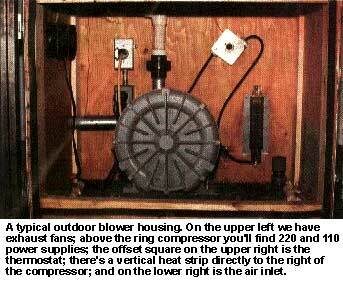 The ring compressor is a much quieter air supply for the average neon plant. It operates by having a large circular "ring" driven by a motor with blades somewhat like a fan that forces the air out of the housing. Along with being probably the quietest form for supplying air for a neon plant, it most certainly has to be the easiest to maintain. The electrical motor shaft is directly coupled to the ring, therefore eliminating all the hassles of figuring the proper pulley sizes, shaft alignment, and all the problems arising from the use of a belt drive system. 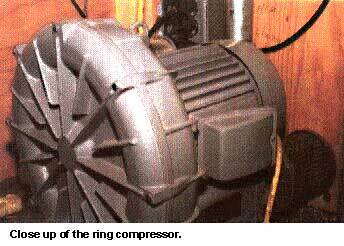 As far as the upkeep of the ring compressor, it is virtually maintenance free. The bearings are factory sealed and require no further maintenance by the user, and because of the direct drive design, there is no oil to be maintained or changed. Other than periodically cleaning the air inlet filter, which has to be done on all blowers, there really isn't much more to do. They can give many years of trouble free service and when one looks at the labor cost of maintaining a lobe type blower versus a ring compressor, the advantage definitely goes to the latter. Because of the direct drive design of the ring compressor it creates the distinct disadvantage of not being able to control the volume of air produced. The manufacturer predetermines this and you have to buy the appropriate size for your needs. Another characteristic of the ring compressor that may be undesirable is that the operating pressure is lower than that of a lobe blower and can create some unique problems as far as running certain fires. The typical one-man neon plant needs from 17 to 27 cfm of air to operate the fires, depending on the burners being used. As you can see from the above chart the 42 cfm compressor can provide enough air for one to two stations and this particular air supply does not necessarily need a pressure relief valve. The max operating pressure is actually higher than the 94 cfm model. This pressure is very important if you plan on using a 24" ribbon burner and doing a lot of soda lime or classic glass. A shop I recently worked in expanded it's operations to include another set of fires and we had a 94 cfm blower which provided enough air volume, but didn't provide enough pressure to get a really hot flame for our 24" ribbon burner. We were using two five-point cross fires, two cannon fires, a 16" and a 24" ribbon burner, and two hand torches, so a 42 cfm compressor probably would not have provided enough air, even though the pressure was higher. I decided to go with the 150 cfm compressor and would blow off the excess air volume with a pressure regulator, and would have the extra air available in the event of future expansion. This may seem like overkill to get the extra half-pound of pressure, but believe me; it made a world of difference when making 24" ribbon bends of 15mm classic glass. Although the lobe type blowers can operate at higher maximum pressures, (6-10 psi) I feel that the ring compressor is the better way to go for the overall performance advantages listed above. Should a person setting up a neon shop start out with a 150 cfm blower to allow for future expansion and use it on only one set of fires? Yes and no. It is very important that the maximum psi is followed to prevent overheating and possible damage to the compressor. A ring compressor should operate warm but not hot. If a 150 cfm blower is installed on only one set of fires and there is not enough air bypassed through a relief valve, the pressure will not reach the desired amount due to backpressure inside the housing and will cause the compressor to overheat and possibly be damaged. The pressure operates on a bell curve; so to achieve maximum efficiency the excess volume of air must be blown off through a relief valve. If you are setting up a plant and plan on only using a crossfire, 16" ribbon burner, and one or two hand torches, I would recommend using the 42 cfm blower, which still allows for adding another set of fires in the future. If your operations grow enough for the need for more than two stations, you should then be able to afford to upgrade to a 150 cfm blower or two 42 cfm blowers at that time. When I first started blowing glass, all of the air supplies that I worked with had a large surge tank to allow for any fluctuations in the operation of the blower. As the lobe type blowers get older and worn, this is an inherent problem. The use of a pressure relief valve that is always blowing off some air helps this problem somewhat, but in more severe cases some type of surge chamber is desirable. The ring compressor does not usually have this type of problem, but I would recommend a minimum of a 1 1/2" airline and a "loop" type installation to prevent starving any of the fires for air or gas. The noise that is produced by either type blower, especially the air that is being blown off makes it desirable for it to be located somewhere outside of the neon room, preferably outdoors. A water tight shed large enough to allow proper cooling should be made out of wood to help deaden the sound, with a sheet metal skin to prevent weathering. Depending on the geographical location of your shop, you may want to install an exhaust fan and a thermostatically controlled heater to keep the blower cool or warm in extreme conditions. With the high operating temperatures of the larger blowers, I would suggest that the first few feet of the air supply line be metal pipe to prevent melting of the PVC pipe or fittings. If at all possible, the pressure relief valve should be placed outside the shed if plumbed very close to the blower to allow the hot air to escape and not build up inside the shed. By strictly following the manufacturer's owner's manual and maintenance program, you should be able to have many years of fine performance from either type of blower. I hope this information helps you in making your decision. Tom Cage has been involved in the sign industry since 1975 and has been a neon glass blower for over 30 of those years. He has published several articles in various trade magazines through the years. Tom also consults to the sign industry and is still blowing glass to this day.